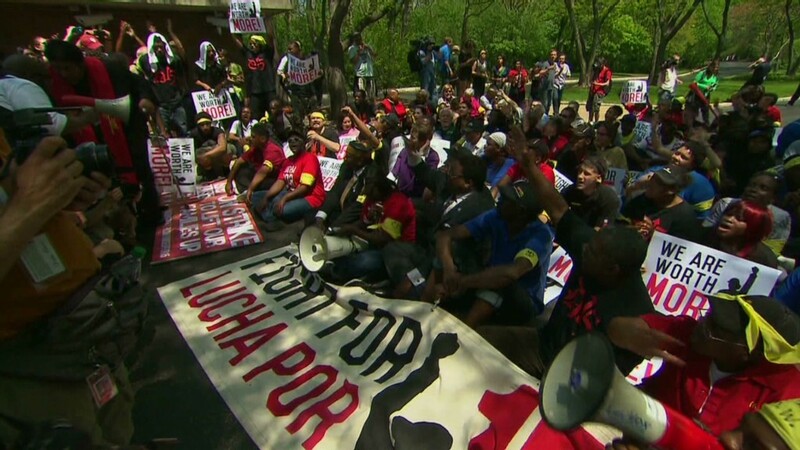 Police arrested 138 protesters Wednesday outside McDonald's corporate campus. The group of protesters had marched up the driveway of McDonald's sprawling campus in suburban Chicago. They were met by about 250 law enforcement officers, including state police in riot gear, and were asked to leave. When they refused, the strikers were taken into custody, according to the Oak Brook police department in Illinois. The police on Thursday updated the total number of arrests to 138, from an earlier estimate of 110 Wednesday. The protests took place a day before McDonald's (MCD) annual meeting on Thursday, when more protests are planned. It was the latest chapter in the broader fast food protest movement that began over a year ago, with workers demanding their wage be raised to a minimum of $15 an hour. "We want to make sure that McDonald's shareholders and CEO Don Thompson hear us and see us and know that these are the workers they are pushing into poverty," said Kendall Fells, a spokesman of the workers organizing group Fast Food Forward. Earlier in the day, McDonald's shut down its main headquarters building ahead of the protests. A company spokeswoman said: "The police advised us to close in advance for security and traffic purposes." That led the crowd of about 1,500 people to march through another entrance in the campus. The protesters included McDonald's and other fast food restaurant workers, clergy and community leaders. In a statement, McDonald's said: "We respect everyone's rights to peacefully protest. We are focused on welcoming our shareholders to McDonald's annual meeting." The issue of fast-food industry pay has been in the headlines over the past year. While the federal minimum wage is still $7.25 an hour, several states and cities have recently enacted laws to increase their wage floor to an average of $10.10 in most places and as much as $15 in Seattle. Just last week, protesters in cities including New York, Philadelphia, Boston, Chicago and Los Angeles joined strikes outside of fast-food restaurants demanding their minimum hourly wage be raised to $15 an hour. The average hourly wage of fast-food employees is $9.09, or less than $19,000 per year for a full-time worker. A recent report from public advocacy group Demos found that CEOs at fast-food companies earn 1,000 times what the average fast-food employee earns, making it one of the biggest pay disparities in the American economy. -- CNN'sTed Rowlands contributed to this report.